Iran’s leaders call out US over Poland meeting as hundreds protest Tehran government on the streets of Warsaw. Warsaw, Poland – Iran’s foreign minister has criticised a Middle East conference co-hosted by the US in the Polish capital calling it “another attempt by the United States to pursue an obsession with Iran”. The denunciation came as hundreds of demonstrators protested on Wednesday outside the venue against the Iranian goverment demanding “regime change”. The anti-Tehran demonstration was organised by the National Council of Resistance in Iran, and protesters hoisted Iranian flags and held banners against the political repression in the Islamic Republic. Foreign Minister Mohammad Javad Zarif said at a news briefing in Tehran the two-day Warsaw meeting attended by the delegations from 60 countries was “dead on arrival”. The conference and demonstration came as 20 members of Iran’s elite Revolutionary Guard were killed in a suicide attack in the southeast of the country. Describing the Poland meeting as the “WarsawCircus”, Zarif said it was “no coincidence that Iran is hit by terror on the very day” the talks began in the Polish capital. “Especially when cohorts of same terrorists cheer it from Warsaw streets & support it with twitter bots? US seems to always make the same wrong choices, but expect different results,” Zarif wrote on Twitter. Attending the meeting, Israeli Prime Minister Benjamin Netanyahu said it was important because Arab and other leaders “are sitting down together with Israel in order to advance the common interest of war with Iran”. Some of the demonstrators, mostly Iranian dissidents in exile, imitated public executions that take place in Iran. 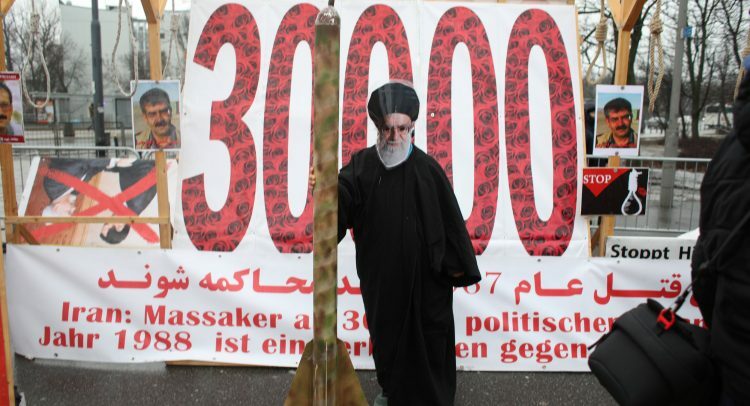 One protester with a mask of Iran’s Supreme leader Ayatollah Ali Khamenei held a paper ballistic rocket. “In order to have a piece and security in the Middle East there has to be a major change in theocratic dictatorship in Iran and it must end – and end quickly – in order to have peace and stability,” said Rudy Guiliani, the personal lawyer of US President Donald Trump who attended the conference and addressed the rally. Giuliani, who represents the exiled Iranian opposition group Mujahedeen-e-Khalq (MEK) at the Warsaw conference, said Iran cannot be trusted to comply with the requirements of JCPOA, the 2015 nuclear deal that was signed to prevent Tehran from building nuclear weapons in exchange for sanctions relief. Tehran needs to be isolated because of its destabilising influence in the region, he said, insisting he did not represent Trump at the event. Giuliani, the former New York City mayor, said the main goal of the protest was to push the participants of the conference to focus on Iran. Speaking to journalists after his speech, Giuliani called for “regime change” in Iran. Robert Torricelli, a former US senator who also attended the Warsaw conference representing MEK, was also categorical with the call for different leadership in the country. “The thousands of martyrs in Iran, laying in their graves are a testament to the fact there is no negotiating with this regime. The regime must end now,” he said. In Tehran, Ayatollah Khamenei said on Wednesday that negotiations with the US would bring “nothing but material and spiritual harm”. “The resolution of any issues is not imaginable,” he said. The talks woud be like “going on your knees before the enemy and kissing the claws of the wolf”. Khamenei’s remarks were part of a seven-page statement read out word-for-word on Iranian state television and heavily promoted in the run-up to its release. The remarks come two days after the 40th anniversary of the 1979 Islamic Revolution amid heightened tensions between Tehran and Washington.